Motion picture studios know why some of their movies become hits – positive word-of-mouth that becomes viral. Great critical reviews do not correlate with box office returns. In this knowledge age, that buzz is being used to make better movies via test screenings before they’re released, and online fan review boards for sequels and related genre films. This is especially becoming more prevalent in TV show production, where fans have increasingly more say on the content of upcoming shows, like on Amercian Idol. Bzz Agent is such a pre- and/or post-product design, buzz creating service, established to either help a company produce a new product, or promote/improve an existing one. 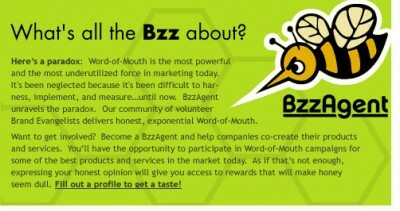 Companies come to them needing help with their products/services, and Bzz Agent creates a community of individual bzz agents that they recruit to carry out the task. CoolTown Studios provides the same kind of service through its beta communities, except the focus is on developing real neighborhoods and the ‘bzz agents’ get to live and work in the products they help promote/improve. Read a great article on buzz here.